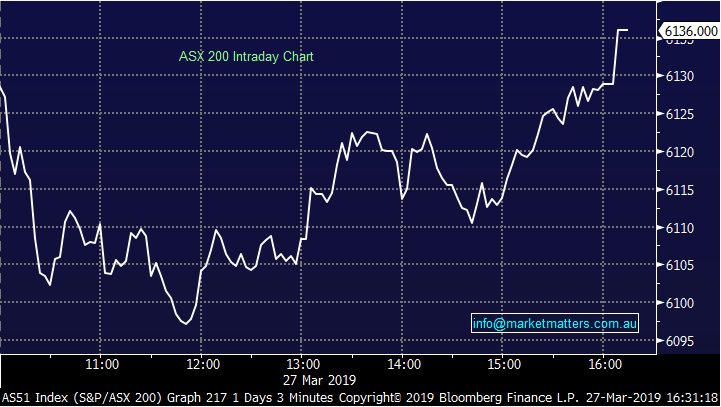 The ASX200 started the day soft, briefly dipping below the 6100 mark just before midday with bank stocks being the biggest drag at the time. Buyers stepped up in the afternoon with 3 of the big 4 moving back into the black – Westpac (WBC) the laggard post Monday’s remediation update – while the miners also caught a bid with investors cheering yesterday’s reopening of the ports in Western Australia as Cyclone Veronica moves on. These sectors combined to see the index close back in the black right on the close, 40 points from the day’s low. The big macro news today was the RBNZ signalling the next rate move would likely be lower, sending the NZD crashing. It is trading more than 1% lower against our Aussie, and over 1.5% lower against the greenback. 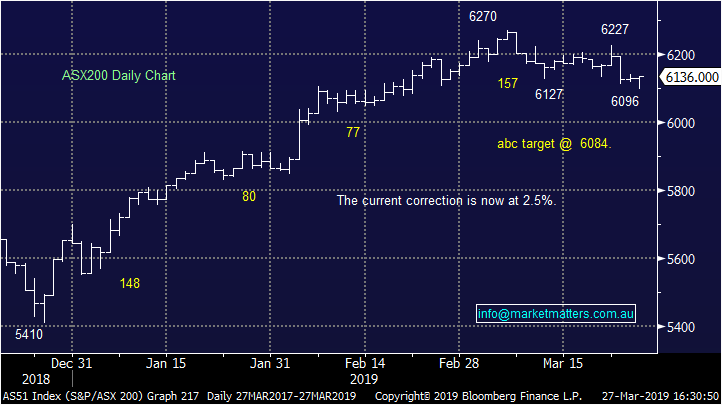 The central bank left rates on hold for now but pointed to weaker local and global data impacting future moves saying "the more likely direction of our next OCR move is down." A few of the NZ based stocks did well as a result – Spark New Zealand (SPK) and Air New Zealand (AIZ) both added more than 1%, while Kathmandu (KMD) bounced back from yesterday’s sell off post the first half result with a +3.29% climb today. **Clarification** In today’s income note we made mention of WAM Leaders (WLE) with a price of $1.25 implying that it was trading at a premium to NAV which sits at $1.20 at last update (28th Feb). That was incorrect. The actual price was meant to read $1.125 which was the price when the data was sourced. That means WAM Leaders is trading at a discount to its assets, which is quite rare for the Wilson stable. Their global LIC, WAM Global (WGB) is the other one trading at a discount – a bigger one - with NAV as at 28th February of $2.13 versus a share price today around $1.91. Sincere apologies for the error. As an aside, there seems to be a lot of interest in listed investment companies along with the new breed of listed investment trusts. Would it be worthwhile running a webinar on this? 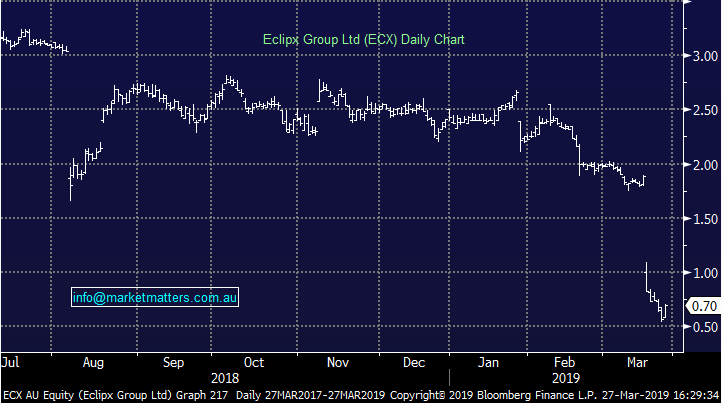 Eclipx (ECX), +22.81%, had fallen nearly 70% in the 5 sessions to yesterday’s record low close, but has staged a recovery today in the face of the weakness after the company assured the market it remains within its debt covenants whilst also looking to offload some non-core businesses. As a quick recap, the vehicle leasing and fleet management company told the market profit had slipped 42% in the first 5 months compared to the same period last year. This also coincided with the end of merger talks with McMillan Shakespeare (MMS). Eclipx got on the front foot today to show the market it remained well within covenants whilst also announcing that it has received offers for its non-core businesses Grays and Right2Drive. These business are now officially on the market with the company planning to use the proceeds to pay down debt. ECX is cheap on many multiples, but won’t be cheap enough if it’s woes continue – a wise man once said a downgrade is never priced in. We remain concerned about the state of the business, a 42% downgrade should not sneak up on you like that. 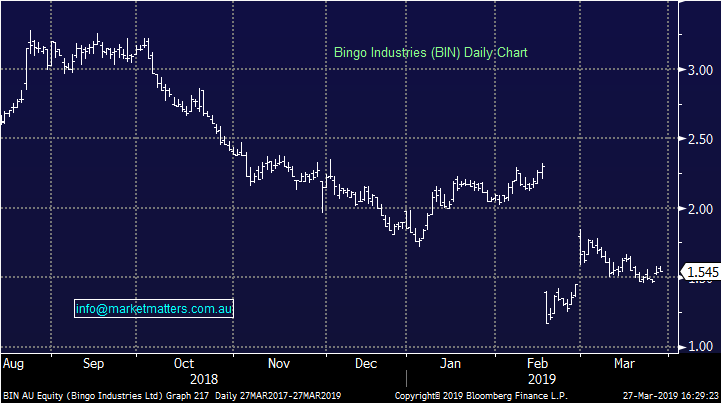 Bingo (BIN) +0.32%, put its first share buy-back notice out this morning meaning that they started buying back stock yesterday as part of their announced $75m program. They’ve bought back around $4.2m worth of shares paying between $1.513 & $1.5697 – more to come which should be supportive of the stock. The stock ended up +0.32% today at $1.545 – we are expecting an announcement regarding the acquisition of Dial-a-dump next week. 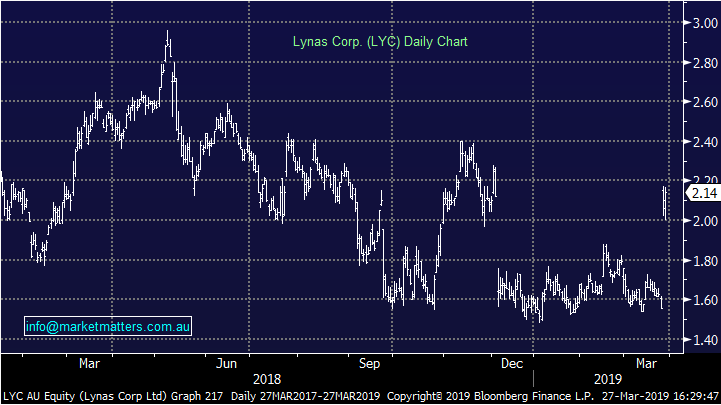 Lynas (LYC), +1.9%, had a surprising rally today despite essentially declining Wesfarmers’ takeover offer. The company said they would not work with the bidder with the current structure “in the indicative and highly conditional proposal.” Perhaps the market expects a revised offer from Wesfarmers.